Come explore, investigate and discover in this hands-on series of science and math classes. 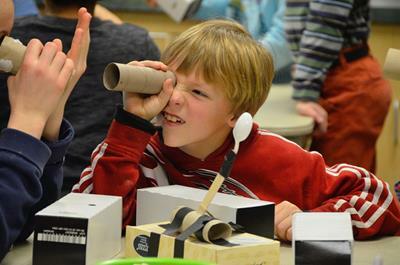 Each session provides opportunities for inquiry learning, projects, experiments and take-home ideas. * Looking to register for more than (3)? Imagine Children's Museum is the sole owner of information collected on this site. We will not sell, share, or rent this information to any outside parties, except as outlined in this policy. We collect information from our customers to process orders and better serve you with pertinent information, such as order confirmations and order status updates. Information collected includes your name, shipping address, billing address, telephone numbers, e-mail address, and payment information such as your credit card number. We also require you to submit a username and password of your choice for your future access to your account information. To safeguard that your user name and password remain confidential, DO NOT share this information with anyone. If you elect to receive our newsletter or special promotions, your contact information will be used for the delivery of these items. We allow third-party companies to collect non-personally identifiable information when customers visit our site. These companies typically use a cookie or web beacon to collect this information in order to provide advertisements likely to be of interest to you. In order to process your orders placed on this website, you must first complete the registration form. During registration, you will be required to provide your contact information, which includes your name, e-mail address, telephone number and street address. This information is used to provide you with important Imagne Children's Museum services such as automated order status updates via e-mail. We may employ third party companies to perform functions on our behalf. These functions may include order fulfillment, package delivery, marketing assistance, postal delivery, and credit processing. The third parties we contract for these purposes have limited access to your personal information and may not use it for other purposes. We may frame or mask another website so that the look, feel and interface simulate the experience of browsing a genuine Imagine Children's Museum web page. Extreme care and discretion is exercised when evaluating third party sites. We only brand third party sites if their organization applies stringent security and privacy practices which parallel our own commitment to safe online shopping. Copyright 2018 Imagine Children’s Museum. All rights reserved. The information on this website is the property of Imagine Children’s Museum. Unauthorized linking or reproduction of images or content is prohibited. Please contact us with any requests for permission to link to this website or to obtain consent to use any of the materials or images on this site. shop-imaginecm.org and imaginecm.org takes precautions to protect its customers' information. As of November 6, 2014 Tam Retail software used on shop-imaginecm.org no longer supports the version 3.0 SSL protocol. our database. For future transactions, you will be required to re-enter your information. privacy, and what they can do to ensure that customers' information remains protected at all times. can send us an email at itstaff@imaginecm.org. to send them such information. time of your order, you may opt to not receive special offers and news by clicking the appropriate field. details on how to be removed from our mailing list should you choose to be removed. shop-imaginecm.org communications to automatically unsubscribe. notify you here, by email, or by means of a notice on our homepage. and ask for the Communications Department about changes and updates. Shipping is completed by USPS taking 5 to 7 business days to process and fulfill the sale of memberships and gift cards. Allow a longer process time during the holiday season. Membership accounts will be active immediately after purchase in which a photo I.D. may be used for museum admission check-in even when the membership cards have not arrived in the mail. Classes, Programs and Events are nonrefundable. Events and programs take place rain or shine unless otherwise notified. All events and programs begin promptly at their scheduled time. No refunds will be given for cancellation, no-show, or late arrival. If minimum class enrollments are not met, the Museum reserves the right to cancel or reschedule the program at least 7 days prior to the class. In such case, your entire tuition will be refunded.